What happens if you go away for a fabulous summer break and your dentures crack? Here at Adam Norris Dental Laboratory, we have the answer. Take a spare set away with you. There is nothing worse than going away and on the first night of your holiday breaking your dentures (we know because some of our patients have told us). Especially if your holiday is abroad or on a cruise ship, leaving you to make do with either a broken set or, even worse, no dentures at all. At Adam Norris Dental Laboratory we can copy your existing dentures ensuring they fit exactly the same as your current set. The process involved in making these duplicate dentures, is much shorter than starting a new set from scratch and so they will be ready in a much shorter time. So, once you have your new copy dentures you can go on your holidays happy in the knowledge that you will always have backup dentures if ever you need them. This entry was posted in Blog on 26th March, 2019 by Adam Norris Dental Labaratory. Christmas is fast approaching. If your dentures feel worn down or do not fit as well as they once did, now is the time to sort it. 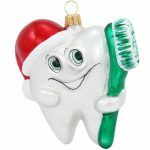 Make an appointment to see Adam Norris, our Clinical Dental Technician, and get your new beautiful smile in time for Christmas. This entry was posted in Blog on 26th September, 2018 by Adam Norris Dental Labaratory. Last month Adam Norris Dental Laboratory had 16 people enquiring about denture repairs. Nobody likes it when they have problems with their teeth, but to have a broken denture is worse. You can’t eat your food, confidence levels drops and lots of people don’t like to be seen without their amazing smiles, especially in this lovely weather. Some people explained that they had contacted their dentists for a repair but were told they would be without their teeth for 2 days. At Adam Norris Dental Laboratory we understand how important a set of teeth are to people, so we make sure that we are always available to fix dentures. If your dentures are broken or have a small crack in them, call us and book in to have them repaired the same day. This entry was posted in Blog on 3rd July, 2018 by Adam Norris Dental Labaratory. 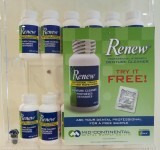 We are pleased to announce that we have received a new delivery of Renew Denture Cleaner, this product is brilliant at cleaning dentures and has already started flying off our shelves. At Adam Norris Dental Laboratory we found we had the same people returning regularly asking us to clean their dentures. Sometimes the cleaning was required due to being a smoker, sometimes due to drinking a lot of coffee or red wine, and sometimes just due to a natural plaque build up. We are always happy to clean dentures, but we know its not always very convenient for patients. What we are now able to offer, in addition to our in-lab cleaning service, is a new cleaning solution which you can use at home. The home cleaning solution is called “Renew”, this cleaner does not need to be used daily, in fact only when you feel the dentures need them, it will remove tobacco, coffee and wine stains as well as plaque and tartar build up. This product is not available at pharmacies or chemists, in fact, we are the only stockists in the Chelmsford area. We have free samples of the product available in our clinic, pop in and try some. This entry was posted in Blog on 15th January, 2018 by Adam Norris Dental Labaratory. We have just successfully completed a new lower denture for this patient. She came and had her free consultation with Adam Norris, our Clinical Dental Technician just before Christmas, and she described how her existing dentures no longer fitted properly. She also felt uncomfortable smiling as the appearance of the dentures did not look right due to the tooth being the wrong colour and size . With the extensive range of teeth available in our Laboratory this patient has left and is very happy now ,with both the fit and appearance, of her new lower denture. If you are not happy with your dentures, call today and book your free consultation with Adam Norris, CDT. We have this week received an amazing testimonial that we just had to share. Couldn’t be more pleased with my flexible denture. No more ugly wires when I smile. Having had NHS dentures in the past, you can imagine how I feel about having a flexible denture. I didn’t really think it would be this good. Wouldn’t hesitate to recommend Adam Norris Dental Laboratory to my friends and family, 5* service. Many thanks to everyone who has had a part in giving me such a positive experience. This entry was posted in Blog on 12th October, 2017 by Adam Norris Dental Labaratory. Our new wheel chair ramp has arrived. This new lightweight ramp makes accessing Adam Norris Dental Laboratory’s front door even easier now, everyone is able to carry and manoeuvre this into place! Here at Adam Norris Dental Laboratory, we have always aimed to help all our patients to be treated in a comfortable, unrushed environment, and now that we have this new ramp, patients can also access the building with much greater ease. This entry was posted in Blog on 27th September, 2017 by Adam Norris Dental Labaratory. Look what has just arrived at Adam Norris Dental Laboratory. Disinfectant spray for sports mouth guards. 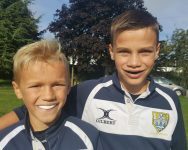 Mouth guards are often kept in boot or kit bags and only come out just before use. Many are dropped on the floor with the potential for nasty germs to spread. 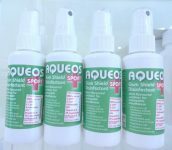 Aqueos sport gum shield disinfectant is mint flavoured and kills 99.99% of bacteria, fungi and viruses. This entry was posted in Blog on 21st September, 2017 by Adam Norris Dental Labaratory. Rugby session is just starting, children and adults all need securely fitting sports guards to protect their teeth. Many people buy home made sports guard kits for their local sports shops. In many cases the finished guard is loose fitting and regularly falls out whilst playing their choosen sports, making it hard to speak to fellow team mates and more difficult to breath. Here at Adam Norris Dental Laboratory we make custom fitted sports guard for all sports including rugby, hockey and boxing which are thicker than the shop bought kits and are a custom fit. In short, our sports guard offer much better protection for your teeth. The process is very simple, we take an impression of your mouth, then pressure form the mouth guard to fit your teeth perfectly. Our sports guards are available in many different colours. You will have your finished sports guard within the week! At Adam Norris Dental Laboratory we understand how important you and your children’s teeth are, we are open Monday-Friday, 9am till 5pm. This entry was posted in Blog on 13th September, 2017 by Adam Norris Dental Labaratory. The summer holidays are fast approaching and everyone is getting ready, dragging suitcases down from the loft and washing all their summer clothes in anticipation of some fun in the sun, but have you cleaned your teeth. Here at Adam Norris Dental Laboratory we can clean your dentures whilst you wait to allow you to go away with a beautiful bright smile. Scale build-up occurs naturally in the mouth and can be very tough to remove with a tooth brush. We can also give advice on how to clean your denture in future. Before and after pictures of a cleaned denture. At Adam Norris Dental Laboratory we understand how important a clean set of teeth are to people and their health, so we are available for scale removal cleans as a walk-in service. we are open Monday-Friday, 9am till 5pm. This entry was posted in Blog on 6th July, 2017 by Adam Norris Dental Labaratory.